…Right now, you’re probably either staring at your screen in slack-jawed disbelief, or shouting disgusted, disdainful obscenities at us through it. Either way, once you’re all finished with that, please allow us to explain. Potty training your child in one day isn’t some crazy, new-fangled technique we just came up with. It’s a crazy, new-fangled technique that psychologists Nathan Azrin and Richard Foxx came up with way back in the 1970s. 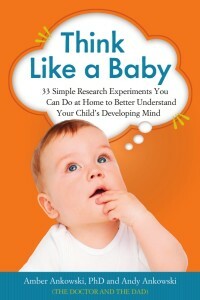 They wrote a book about it called Toilet Training in Less Than a Day, which has sold over two million copies. In fact, the Doctor’s own mother used this method on her and her siblings back when they were wee babes, and you’ll be happy to know that they are all experts at using the potty now. Potty Train Your Child in Just One Day by Teri Crane: The book does a great job of explaining everything you need to know to make this crazy undertaking a success. We recommend reading the whole thing in advance, and jotting down notes to refer to on the big day! A doll that actually pees: For girls, or boys! During the first half of the day, your child doesn’t even try to use the potty. Instead, your kiddo teaches a new doll how to use the potty. This technique is pretty powerful, because teaching someone else something is often the best way to learn it yourself. Most of the morning is spent alternating between taking the doll to the potty and celebrating its successful pees and poops, checking the doll’s underpants every once in a while and celebrating when they’re still dry, and staging doll potty “accidents.” And when you’re not doing that you’re reading and watching every single potty book and video you could possibly get your hands on for the day. The second half of the day is all about your child. Immediately following lunch and/or nap, your child gets his own “big kid” underwear. Then you spend the afternoon snacking on pee-inducing salty foods and all the beverages your kid can handle, practicing your child’s budding potty skills and celebrating his successes (adding stickers to the poster board is a great way to keep track of them all), and of course reading and watching even more potty books and videos. The day culminates in a “big kid” party, where he gets a special gift and you ceremoniously throw all of his diapers away! While this day will be a fun “potty party” for your child, complete with gifts and special treats, it will be totally energy-sucking for you. By the end of the day you will be sick of hearing yourself talk about peeing and pooping on the potty. And you will probably also be absolutely positive that despite all of your preparation and hard work, the day has been a completely disastrous, soul-crushing failure. Because guess what? There will be at least as many accidents as there are successful potty fillings. And when your child goes to bed, you will be totally sure that all your effort has all been for naught. But it won’t have been for naught! Because over the next few days you’ll realize that it has actually worked. All of the teaching, practicing and potty propaganda has somehow seeped into your child’s brain (and bladder), and following the one-day training he will be mostly to totally potty trained. Sure, there will be some accidents here and there for a little while, but not very many considering you only spent one day practicing! Tone down the party. Crane’s book suggests that you take the party concept to the nth degree, developing a theme based on your kid’s interests and decorating your house to the max for the occasion. We do a very scaled down, decoration-free version of that – just calling the treat-filled day a “potty party” has always made it feel special enough for us. Do not let your kid see you eating poop. For the doll’s simulated poop accidents, we suggest using brownies. But do not let your kid know that they’re brownies, and definitely don’t let him see you snacking on it. What kind of potty training issues would that lead to? Visit your local library. 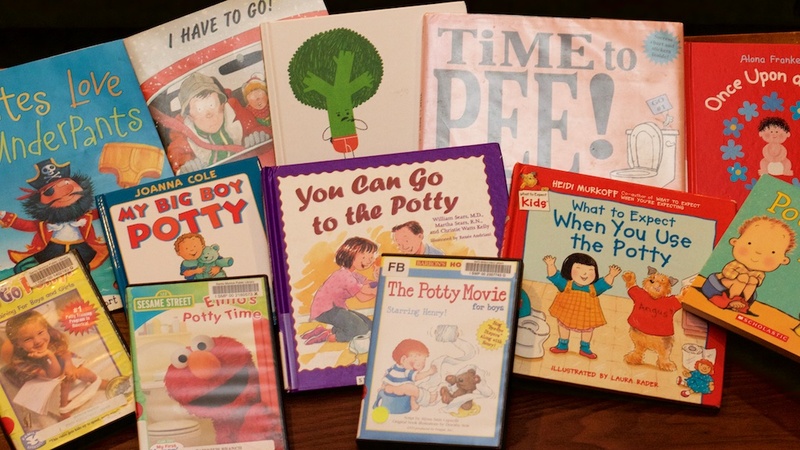 When you get there, ask a reference librarian to gather all the potty books and movies she can possibly find. While you may have some in your personal collection, you’ll want as much as you can find to fill your potty day. Use towels strategically. For the afternoon, lay towels out on the floor to be your special “potty party” hang out spot when you’re not in the bathroom. The towel will get peed on, so have spares. Siblings can be an asset. When the Doctor’s mom used the one-day method on her kids, she made sure to be alone with the kid that was being potty trained, sending the siblings away to be with a babysitter for the day. But when our son was being potty trained, we took a chance and let his big sister participate in the “potty party” day – which turned out to be a great move. Motivated by getting to share in the rewards each time he was successful, big sis was an enthusiastic role model and cheerleader for our son. It really does work!! We used the original 70s book (with no party). I was doubtful too, but it was amazing (and so much less painful than I always expected potty training to be)! Yes! It takes guts, but it’s SO worth it! Great website! I’m also a Domer (2001), and I have a 2.5 yo son. Can you address the right age for potty training? Thanks! Hi Kathy! We’ve found that about two and a half years old has been just the right age for our kids to be potty trained. But in potty training, it’s typically less important that your child has reached a specific age, and more important that he has shown signs of readiness – like requesting diaper changes because he doesn’t like the feel of a wet diaper, willingness to try out sitting on the potty now and then, keeping his diaper dry for a couple of hours at a time, and an ability to follow basic instructions. That being said…in our experience, the one-day potty training method has been so effective that it worked for our son despite the fact that he didn’t show many of these signs beforehand. Good luck (and Go Irish)! My daughter just turn two yesterday. I have also seen the sign that you mentioned. So I’m planning to train her soon with one day potty training method. Hope it works! Good luck, Dipti – we’re pulling for you! Will this work with a kiddo that’s just learned to walk? I want to potty train my daughter as soon as she can steadily walk. 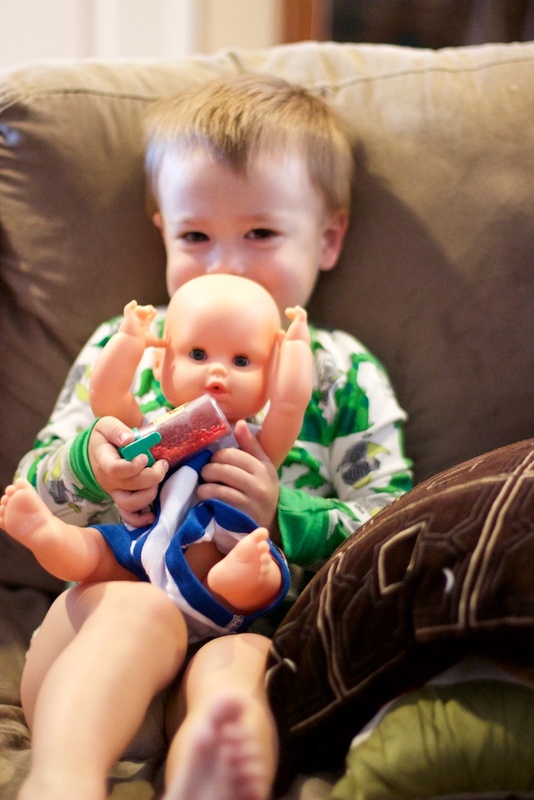 This particular method requires your child to teach a doll to use the potty. So before devoting an entire day to training your still-pretty-tiny toddler, ask yourself whether she is able to understand and act on complex sentences and commands. If so, go for it! If not, you might want to tell her to keep her pants on just a little longer! Good luck!